Mactan Cebu International Airport Authority (MCIAA) wants to increase the terminal fee for all passengers. For domestic passengers, the proposed rate is PHP 300, from the present rate of PHP 200. For departing passengers of international flights, the terminal fee will be increased from PHP 550 to PHP 750. This would be the highest terminal fees in the Philippines. The Philippines are known among travelers as “Fee-lippines“. Nowhere else in the world passengers have to pay terminal fees in airports and harbors. These fees are included in the tickets and paid by the airlines or shipping company. Here in the Philippines one has to pay this fee in cash and nearly anywhere. In Manila and Cebu airports this fee is now usually included in the ticket price. 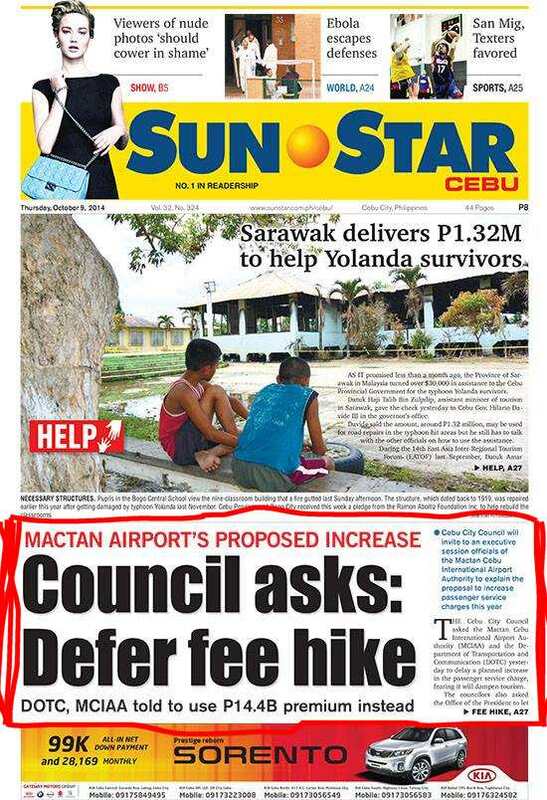 But now Cebu’s Mactan Cebu International Airport Authority (MCIAA) wants to get more of your money. The Cebu City Council asked the Mactan Cebu International Airport Authority (MCIAA) and the Department of Transportation and Communication (DOTC) on Wednesday to delay a planned increase in the passenger service charge, fearing it will dampen tourism. Why this? It was earlier reported that GMCAC will get PHP 181 and PHP 383 from the service charges of domestic and international flights, respectively. Why are they getting such amounts when, in fact, the new airport infrastructure that GMR will be operating is not even in place? Would that not seem like the passengers will be the ones paying for or investing in the airport expansion rather than GMR? Earlier this year, MCIAA had already paid a PHP 14.4-billion premium to GMR-Megawide for the airport expansion project. Where is this money now? During an earlier public hearing on the proposed PSC (Passenger Service Charge) increase, the MCIAA General Manager said the increase is needed to cover the decrease in the airport authority’s revenues as a result of the privatization of some airport operations. Quo vadis Philippines? Tourism is breaking down because of natural catastrophes, crime and terrorism. Politicians are subject to soap operas called “Pork Barrel”, “Binay-Gate” and other terrorists. Do Pinoys read foreign press? And sorry for all the sharks out there in the sea. Humans are stupid – aren’t they? Funny it happends almost the same time as NAIA announced that the terminal fee will be history..ok it was to happens 1october but now pushed forward to 1 november !! I also hate that captcha! But I hate more to get rid of all that viagra spam in the morning.